(Dodoma) TWO IHI scientists, Alfred Boniphace and Dr. Beda Levira, represented the Institute in this year’s Water Week commemorations which was held at the national level in Dodoma during the week of March 18-22, 2019. The commemorations had three major events: Scientific Conference on Water (March 18 and 19); Energy and Water Utilities Regulatory Authority (Ewura) Day (March 20 and 21) and Joint Water Sector Review (March 22). The theme for 2019 Water Week is, “Leaving No One Behind: Accelerat ing universal access to water supply and sanitation services in a changing climate”. 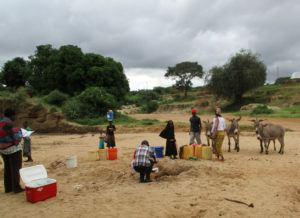 The knowledge and experience is part of the recently phased out study conducted in Kilombero, Buguruni, Kondoa and Chemba which aimed at investigating the effectiveness of WASH interventions to reduce health vulnerability to climate change in Tanzania. The two scientists submission’s central message underlined that we shouldn’t over-rely on the water sources quality improvement interventions.